It is the week called holy, and our attention is focused on the mystery of redemption that will soon again be remembered as we near the Holy Triduum. The events leading to Calvary can be relived through the heart of the Mother who lived them perhaps most personally after Christ himself. And so, for a time, let us turn to her and to the beginning of the story that will lead us to Good Friday, and beyond it to the empty tomb. No more than a maiden in Nazareth, and yet Mother of God. The fulfillment of the story of redemption begins with these words — the blessed greeting brought to the Virgin in the simplicity of Nazareth would unleash centuries of grace and stands still as the pivotal tipping point in the history of man. Whether believed or not, the Savior came to the world and chose for His mother a maiden. Her necessary and free consent gave God permission. Between the threshold of Nazareth and that of the Cross of Calvary lies the arc of human history. The desires of the ancients, the proclamations of the prophets, the long sought fulfillment of the aspirations of many generations, the covenants and the fore-tellings, the atonement for the world’s sin, and even our own ache for happiness, came together at the threshold of one human heart. Through suffering, and loss, and the joy of communion, her life was one resounding and blessed Yes. She would be the vessel that would bring the Lamb into the world so that he could offer himself for love of us until the end of time. She would receive the Word made flesh, and cradle the Christ. As they took Him down from the cross, they returned Him to the cradle of the maiden’s arms. How many attempts at belief mirror this very same receptivity–the receptivity of the Virgin’s human heart to the hidden presence of the Lord–the Infant, whose very coming was intended for its ending. No longer barren was the wasteland of desire. The Word had come among men, in the manner of the gentle. He sought a mother, like all men have, and honored her with his request. And her response unleashed the drama of redemption in its fullness. How pure a love and powerful a Fiat! What grace in acceptance; what strength in suffering and humble generosity! So powerful and blessed was her Yes, it is echoing still now in souls who face for themselves that portent announcement of the grace of God, asking permission to reside in the depths of their hearts and there remain. The Love that seeks our love–the same God is still in need of a human dwelling place. The beginning of His life required her consent. It would be her faith that would sustain her at the hour of His death. The One who had been infant in her womb, God in her heart, strength for her soul, would also become our Savior on a Cross. And she would stand there silently, sorrowfully, solemnly, and there become Mother of the Living– those redeemed by her own Son’s sacrifice. And watched, and learned, and fortified, and held. That was old silence now before His cross. She had no more. No speech. No strength. No life. She was the virgin maiden. She was His mother. She was His first believer. She was the Woman of the Cana feast; the silent witness of his work, the one would yield her very Son through her lacerated love. She was consent. She had to be His mother first. What blessed Yes! Should we accept the invitation to see her maternity in its fullness, we might accompany her along the Via Dolorosa, for then she must have known that fullest love, is the love of unreserved consent before God. Watching her there beneath his Cross, we see ourselves reflected. And in the economy of grace, like her we gain the chance to bring Christ to a thirsty world. 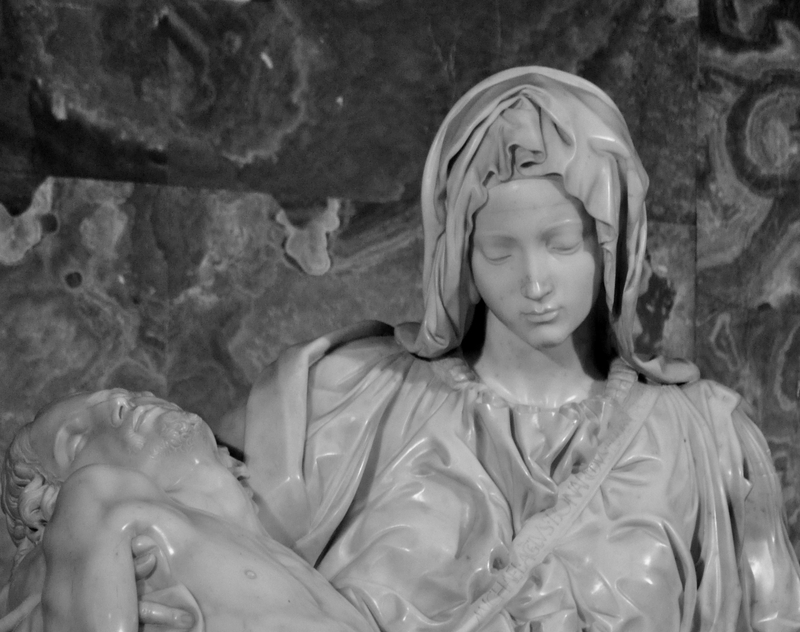 O Sweet Consent, O Virgin of such Sorrows, O Mother of the Living, teach us to be consent. Tearless that could watch the Woman? Hear unmoved that Mother’s moan? Weeping with her Son alone? Grace to please him here below. To stand beneath the atoning tree. Shield me on the judgement-day. Grant it thou the crown and palm.